Tawny-edged Skipper 2, originally uploaded by madcalabrian. This little skipper was spotted while trying to take a photograph of numerous pearl crescent butterflies that were congregating in a single area. 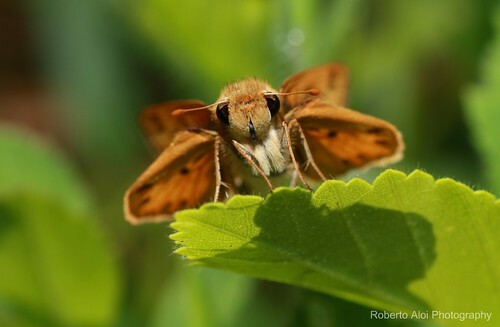 It’s not often I see skippers. At first glanced I thought it was a moth, but then after noticing the antennae I knew I should be shooting this instead. I would estimate it to be less than an inch in size. It was very small and didn’t seem to mind me getting extremely close to take several pictures. I used my 580EXII /w diffuser for this shot. I was on my knees and elbows shooting this little guy. People were riding their bikes and jogging past probably thinking what is this guy doing?! 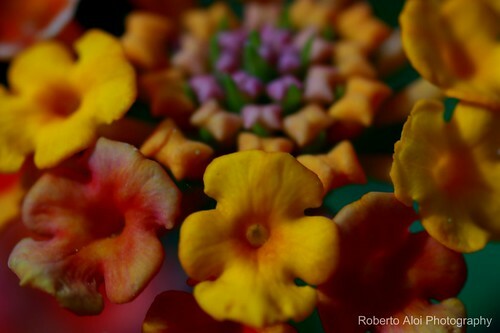 Thumbelina’s Bouquet – Lantana, originally uploaded by madcalabrian. This tiny little arrangement was approximately in inch in diameter and shot at around 1:1 macro. This plant is lantana. Thank you kindly for the ident pseudo elle!